1. Heat a soup pot over medium-high heat and add in the chorizo. Cook for about 3-5 minutes, breaking it up with a spoon while it cooks. 2. Add in the onion and garlic and cook for an additional 3-5 minutes, or until the onion is translucent. 3. Take 14 oz of the fire roasted tomatoes and puree in a food processor or with an immersion blender until smooth. Add to the pot along with the other half of the diced tomatoes (not pureed). 4. Next, add in the thyme, Italian seasoning, paprika, salt and pepper. Give everything a good stir. 5. Once the sauce is boiling, reduce the heat to a simmer and let cook for 20-30 minutes. Stirring occasionally. 1. Preheat the oven to 450° and line a rimmed baking sheet with parchment paper. 2. Spread out the spiralized butternut squash onto the pan and drizzle with olive oil. Season with salt and pepper. 3. Cook in the preheated oven for 8-10 minutes and then remove and keep warm. 1. 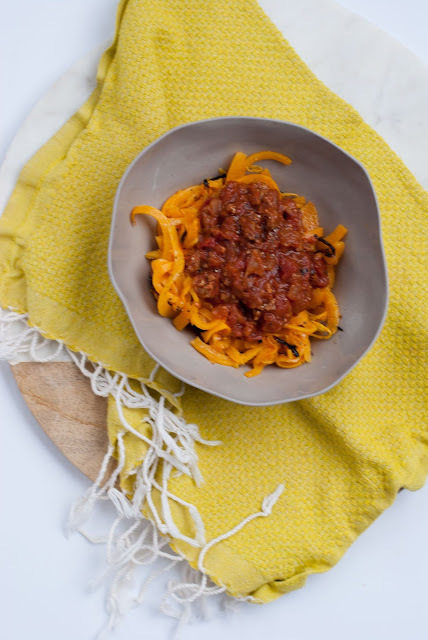 Place your butternut squash zoodles onto your desired serving plate. Top with chorizo marinara. Enjoy!